Where Did Strategic Inquiry Come From? The Strategic Inquiry model was originally developed, tested and refined in a leadership program called SAM which was created and run by Baruch College, City University of New York in partnership with New Visions for Public Schools between 2005 and 2012. During this period, the program’s underlying model for continuous improvement also formed the basis of Collaborative Inquiry, which was mandated in every New York City public school as part of then-Chancellor Joel Klein’s Children First reform. The seed was an assignment in the first iteration of SAM in which teams were asked to identify and improve outcomes for one group of underperforming students in their schools. When all teams struggled to move from talk to action, SAM leaders spent the next four SAM iterations discovering what it would take to ensure that teams could act and succeed. What emerged was a vision of leadership as the collective capacity of a team to improve outcomes for previously unsuccessful students; to ensure that future students like them wouldn’t get stuck in the same places; and to develop in colleagues the capacity to do the same. In other words, leadership became defined as a collective ability to continuously improve a school or district’s “sphere of student success.” What emerged as well was the distilled strategic inquiry model – the underlying essential elements required to bring this vision into practice. Since 2012, the SI model has been adapted and applied in varied contexts, including in two additional university-based school leadership credentialing programs (CLASS at Hunter College and LEAD at California State University, Fullerton) and in school and district-led turnarounds In NYC and beyond. 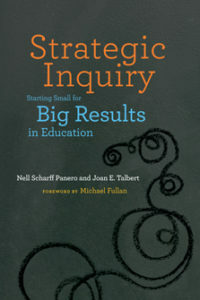 In 2013, Nell Scharff Panero and Joan E. Talbert published Strategic Inquiry: Getting Small for Big Results in Education documenting the model and its impact and highlighting the underlying essential design elements such that they could be adapted in varied contexts. Shortly after, Nell Scharff Panero started Strategic Inquiry Consulting, LLC in response to requests from schools and districts to learn more and receive support implementing the model in their schools. In 2016, Michelle Brochu came on board as a senior consultant. Other current consultants include Felicia Hirata, Rosa Rivera-McCutchen, Kathleen Smith and Joanna Yip. Get the most recent evaluation here.